Rendine's latest townhouse development is complete. Soon to be on the market these contemporary townhouses boast three bedrooms, open plan living, study, two bathrooms and remote double garaging. Primely positioned just moments from the CBD, waterfront, hospitals and the Geelong Football Ground, they offer convenient, luxury living. To view more images of these townhouses, click here. Rendine is again proud to sponsor this champion soccer club, Barwon Soccer Club. Supporting the Boys Under 15's soccer team, Rendine hopes that the club can again taste premiership success. To join or simply keep up to date with whats happening at the Barwon Soccer Club, click here. The Mo Bro's have done it Again! The construction industry employs more than 625,000 people across Australia, making it one of the biggest employers in the country. And unfortunately the statistics surrounding suicide in this industry are quite confronting. This Movember the team at Rendine has come together to raise awareness and make a difference to men's health. Along with clients, friends and family we have raised $3,250. So proud to have been a part of this important cause. Rendine Constructions has signed the GROW compact. We are dedicated to GROWing a strong local economy and reducing employment across our region, targeting our most vulnerable communities. Through buying locally and investing locally we aim to support local businesses and suppliers, improve social outcomes, increase training and employment opportunities, and identify new opportunities that support all in our community. You too can join the GROW movement. Rendine Constructions, together with 3iD Studios and Adams Consulting Engineers, form the consortium that has designed and constructed a new permanent modular school building for Tate Street Primary School in East Geelong. The pedagogical design utilises universal design standards to deliver four classrooms with withdrawal rooms, storage and cloak area, amenities and several outdoor decking/learning spaces. The building promotes the school's literacy program and integrates a contemporary structure to the heritage landscape. See more here. Rendine recently joined genU and many other local businesses on genU's 'What We Do' day. What an amazing insight into how staff, volunteers and businesses like us are engaging with community organisations to bring much needed support and inspiration to all. You too can join genU to provide an inclusive community. Following our entry into the world of Modular Construction, Rendine has featured in the latest edition of Australia's leading modular construction magazine, Built Offsite. Take a moment to read how we, a traditional builder, has made the leap into the emergine phenomenon of Modular Construction. Our Boston Road Development Came Up A Treat! The beach town of Torquay is now home to this stunning coastal development. This mixed development in an envious location offers six retail and four second floor offices with offstreet parking for occupants at the rear of the building. In the heart of a retail hub and moments to the waterfront, this is a prime opportunity for businesses looking to service the south west and Barwon regions. Christine Couzens, Geelong MP, recently popped in to check out the progress of our Modular Construction at Tate Street Primary School - not long now and the kids will be moving into their new classrooms! Pionering a new direction in construction for Rendine, we have more modular projects in production and are looking forward to rolling these out across Victoria in the coming months. Headlining the front page of today's Business Beats section of the Geelong Advertiser is our Tate Street Primary School modular construction. As the modular construction takes shape, works onsite have progressed. Shortly the classrooms will be ready for transporting to their final destination in East Geelong...the kids can't wait!! For the second consecutive year, Rendine has been presented with the Advanced Manufacturing and Industry Award at the Deakin University Geelong Business Excellence Awards. A fantastic accolade that reflects the constant forward thinking approach of the Rendine team...this one will sit proudly in our awards cabinet. Rendine Constructions has commenced construction of modular buildings, the only locally based company adopting this innovative approach to deliver community facilities up to 50 per cent faster than traditional construction methods. The Tate Street Primary School multiclassroom construction depicted here is representative of the innovative approach we are now taking to build enhanced centres for learning across the State. Watch how construction is proceeding offsite here. Rendine Constructions has commenced construction of the City of Greater Geelong's Rosewall Community Hub. The $3.67m modern, mulitpurpose centre will cater to a diverse range of age groups with acitivities, training and community gathering spaces for all to enjoy. Opening early next year the Hub represents a vital asset to the region. The Next Zoolander...Anything is Possible! Is it Blue Steel? Is it Magnum? Or is it Le Tigre?? Our resident model, Xavier Dew, has dropped by to show us his latest catwalk moves. #zoolandersgotnothingonthiskid! Rendine has jumped on board as a sponsor of the annual Cottage by the Sea Race day. One of Australia's oldest charities, the Cottage, located in Queenscliff, is a not-for-profit organisation that empowers disadvantaged kids by supporting them in developing their mind, body and wellbeing. They do this by providing leadership and outreach programs in a positive, healthy, seaside environment. A strong supporter of youth development, we encourage you to donate to the passionate Cottage by the Sea. Work has begun at the new Department of Health and Human Services hared Support Accomodation in Grovedale. The five bed home will provide essential support for people with a disability, helping them to live independently and particiapte in a community life. Rendine has delivered several Shared Support Accommodation homes for our disadvantaged across the Greater Geelong region. At the recent South West Regional Master Builders awards, Rendine Constructions was presented an award for Excellence in Commercial Construction $1m-$3m for our Bellarine Springs Community Centre project. A stunning retirement home facility, the centre boasts a large dining, lounge, bar and gamings area that spills out to an undercover alfresco dining area overlooking the adjacent bowling green. Want to see more of this award winning Rendine project? Click here. Rendine Constructions is once again a finalist in the Geelong Business Excellence Awards (GBEA). At the 2017 GBEA Awards, Rendine was presented with the prestigious Advanced Manufacturing and Industry Award for our work in GPS Surveying, 3D Modelling and GPS automated machine control. Using technology to deliver client projects in a swifter, intelligent and more economical manner, our work was additionally recognised by Master Builders Victoria with a special commendation. Rendine Constructions was again eager to participate in the Annual Gourmet Food and Wine Trail Fundraising event for our long term client, genU. This year our focus was to raise funds for genU's purpose built respite house at Melaluka. Established in 2012 the house still lacks an interactive garden where visitors can spend time relaxing, riding the bike track or gardening. A fantastic day out we look forward to seeing the finished landscaping at Melaluka. Rendine Constructions 30 year membership to the Geelong Chamber of Commerce was recently recognised at the 127th Annual General Meeting of the The Chamber. Greg Mills, Managing Director of Rendine Constructions proudly accepted our certificate. Rendine Constructions have embarked on a fresh era in design and construction with our new project for the Victorian School Building Authority. Our Tate Street Primary School Permanent Modular Building project will deliver a new bespoke four classroom building to the school. Kira is not simply the smile that greets when you first step through our doors, Kira is the latest shining star of Rendine Constructions having been nominated, and now shortlisted, as a finalist in the GForce Trainee of the year Awards. A fantastic achievement and one that we here at Rendine know all too well is most deserving. A valuable asset to our growing team, we wish Kira the very best of luck in succeeding in her nomination. This week our two newest recruits, Ben and Liam, officially graduated from Deakin University. Ben - Bachelor of Engineering (Civil); and Liam - Bachelor of Design (Architecture) and Bachelor of Construction Management (Hon) represent the next generation of the Rendine family. The Rendine Race Day Is Back!!! Rendine Constructions is again proud to support the Geelong St Patrick's Racing Club as their major sponsor for the annual St Patrick's Day races. A fantastic day out at the Geelong racing track, we have again, in true tradition, delivered our fun, quirky theme to celebrate the excitement that horse racing and St Paddy's day brings. Bring your Irish luck as Anything is Possibleat the the Rendine Constructions St Patrick's Day races! What an AMAZING MOVEMBER Effort!!!! With Movember officially over, it's time to recognise the amazing fund raising efforts of our Movember team. The collective effort from the men and women of Rendine, Adams Consulting Engineers and Tuckers Excavations has raised an outstanding $9,437.00....far exceeding our original $5K target. Proud to partake in this important cause the team actively sought to outdo each other with their 'interesting' array of 'staches, though some could only muster a mere baby faced whisp! Thank you to all who donated to improve mens health. Grow a Mo and save a Brois the Rendine motto during the month of November. The Rendine team has jumped on the Movember bandwagon to raise awareness for men's health and support men's health projects so that more men live happier, healthier and longer lives. The early detection of prostate cancer allows a 98% chance of survival beyond five years. If detected late, one can expect a 26% chance of survival beyond five years. Testicular cancer is the second most common cancer affecting men aged 18-39. In Australia one in two men have had a mental health problem. Support the Rendine Movember team and men's health by donating here; https://mobro.co/13609632. The Member for Bellarine, Lisa Neville, joined Rendine and dignitaries from the Bellarine Secondary College following the State Government's allocated funding of $2.4m to refurbish the school's multiple campuses. Rendine commenced works at the Drysdale and Ocean Grove campuses in late July and is expected to complete the works in April next year. Works include upgrades to general purpose classrooms, IT activity areas, general science labs, metal and material related activity area and staff and administration areas. The project is a part of the State Government's $2.5 billion investment to upgrade facilities and build new schools across Victoria. At the recent Master Builders Excellence in Construction awards, Rendine Constructions was awarded a Special Commendation for Excellence in Civil Construction, recognising our outstanding work at the Rocke Bros Container Handling Facility in Lara. The 2017 Geelong Business Excellence awards saw us presented with top honours for the Advanced Manufacturing and Industry award. This reflects our advancements in the application of new technology (3D Modelling, GPS surveying and automated machine control) and the establishment of Geelong's first Construction Business Park in Moolap. A huge congratulations to the Barwon Soccer Club Mens Division 1...2017 champions! Rendine is proud to sponsor this winning club who has finishes with top honours in the Geelong Region Men's Division One league. This great community club is based in Grovedale and welcomes all interested in joining the game. So head on down to see the junior and senior teams in action before the season comes to an end. Our civil team is again proving their versatility having recently been accredited as a Barwon Water contractor for Land Development works. We have moved to our NEW OFFICE at 18-30 Point Henry Rd, Moolap. Located between Blue Scope Steel and Newcomb Sand and Soil, the new Rendine offices are a stunning reflection of our craft as commercial and civil construction experts. Featuring exposed steel, handcrafted timber and floating staircase enclosed in glass, our offices provide a fresh and appealing atmosphere from the moment you enter. Overlooking the former Cheetham Salt Works the bay views are an inspiring and picturesque panorama...Come visit us soon! Rendine Constructions has enjoyed a double win at the 2017 Master Builders Association of Victoria awards. 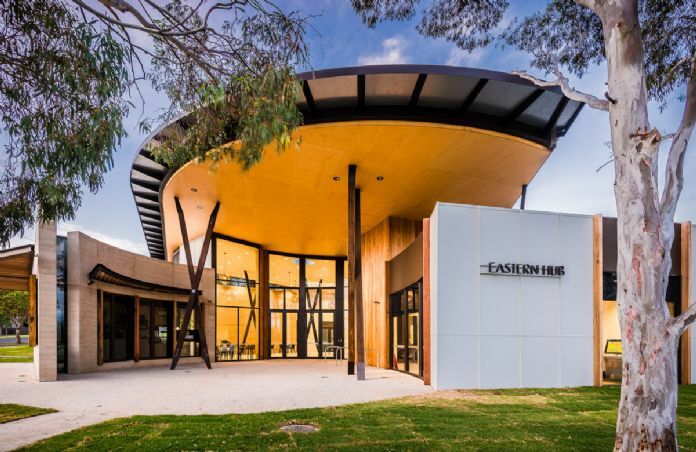 We are thrilled to take the top honours as the South West Regional Commercial Builder of the Yearfor the impressive Karingal Eastern Hub community centre. The Centre was also recognised for Excellence in Construction of Commercial Buildings over $6m. Our client, Karingal, and talented architect, Riordan Gough of FMSA, joined us in our celebrations of the much admired Centre that delivers first class support for disabled and disadvantaged persons in Geelong. Mixing shapes and a variety of materials the building departs from the more typical institutional structures, providing a much more uplifting space. It is of no surprise that the wider community of Geelong has eagerly embraced this facility and all that it offers. Environment Minister Lily D'Ambrosio MP toured the state-of-the-art Barwon Downs Depot which will boost Forest Fire Management Victoria's capacity to protect local communities from bushfires and other emergencies. The $7.2m complex will be completed in the coming weeks and staff of Forest Fire Management Victoria are keen to move in. Responding to winter storms and preparing for the Spring planned burning and pending fire season, the complex will be abuzz with activity. Construction works at the Department of Defence Swan Island site. It's a Greek Easter at Rendine Constructions!!! To celebrate Easter this year, the Greek contingent among our ranks introduced us to a lamb on the spit! The fresh approach to engage in a traditional Greek Easter was eagerly embraced by all staff...needless to say not only were our bellies full, but our smiles were wide! Happiest of Easters' to all. Picking a Winner at the Rendine Constructions St Patrick's Cup Race Day! For the seond consecutive year the Rendine Constructions St Patrick's Cup was a winning day for all who attended. Race goers set a colourful landsacpe on the lush green lawns, ernestly cheering home a winner over the thundering stampede of hooves. Again our staff and clients donated our..ahem...winnings to the Royal Children's Hospital Appeal. If you missed the races this year, don't despair, we will be back again next year! Specialist in civil and commercial construction, it makes sense that we hold a prequalification with VicRoads for the undertaking of bridge and road work projects. The Deputy Premier and Minister for Education, James Merlino, and the Honorable John Eren joined Rendine Constructions at Northern Bay College Wexford Court Campus today for the ceremonial digging of the Stage Four development at the school. Rendine will begin works at the site in early January, representing the fifth project Rendine has delivered for Northern Bay College. As a Gold sponsor of the Fyans Park Primary School Christmas Fair, Rendine Constructions is proud to have supported the schools annual Fair to raise funds for development of the school. And what a great success the event was with organisers estimating that over $30,000 was raised over the evening. The money will fund school projects such as technology equipment, numeracy resources and leteracy readers for all year levels. The Fair proved a fun night for all that went along with music, food, rides, craft stalls, activites and of course, a visit from Santa. It's a busy time for builders across the region so it is of no surprise that we have been awarded three new projects. Kicking off in October was the Healthy Living Centre for Diversitat. More recently we began works in Clifton Springs for the Bellarine Springs Retirement Village where we will deliver their Community Centre. And early next year will see construction begin at the Geelong Lutheran College at Mt Duneed as works for a new Senior Science building will commence. Reflecting great architecture, we are excited to be able to deliver these important facilities to the region over the coming months. Rendine Constructions was recently awarded the $6.9m Barwon Downs Depot and Office project for the Department of Environment, Land, Water and Planning. Demolition at the site has begun despite the falling snow and cool climate. And as you can see, our staff were enjoying every minute of it! The Rendine team enjoyed a double celebration at the recent Master Builders Association Regional Victorian Awards. The Stablesat Inverleigh took the honours for the Best Residential Renovation / Addition over $500,000 while the recently completed Gellibrand Office and Depot (DELWP) won the award for Excellence in Commercial Construction $3M - $6M. Both builds presented interesting challenges for our construction teams however the results were first class. Well done on again delivering quality, award winning results. Today the last of 6,000 cubic meters of concrete was poured at our container handling facility project in Lara. In-house 3D modelling of the pavement allowed for the earthworks and concrete screed to be automated, resulting in early completion of the 16,000m2 post-tensioned concrete pavement. Our site supervisor can now enjoy some more sleep with the 3am starts on concrete pours days behind him! Rendine has been awarded the Barwarre Gardens Retirement Village Stage Four project. Over the coming months we will deliver 28 units at the Marshall site for Karingal. Following the construction of the award winning Anglesea Depot and Gellibrand Depot, Rendine will now deliver the new Depot at Barwon Downs for the Department of Environment, Land, Water and Planning (DELWP). Both projects are valued in the vicinity of $6.5m. Rendine has presented the most outstanding graduating student with a $1000 award at this year's Deakin Architecture and Built Environment awards. Rendine has always taken an active interest in the development of Deakin's A + B students, participating in their recent graduation ceremony, providing work experience opportunities for students, appearing as a guest lecturer, and Chairing the Architectural Advisory Board for Deakin University. Late April saw Rendine complete the impressive Eastern Hub for Karingal. A $6.5m facility that features a cafe, community garden, training kitchen with hydraulic bench and stove tops, technology training labs and flexible event spaces for corporate and community functions and activities. A striking entry and foyer engages visitors with its unique architectural elements that continue to impress as you move throughout the facility. This is the second major project Rendine has delivered for Karingal and a fantastic addition to Karingal's services that the whole community can enjoy. The Deakin School of Architecture and Built Environment held their annual graduation evening last night at their picturesque waterfront location. Rendine attended as a key exhibitor to not only convey our credentials to the students, but to also meet with and chat about their expectations, aspirations and how they could achieve these. It was a relaxed event with many local, national and international architecture and building companies coming together to meet the graduating students and discuss their future career opportunities. Wide eyed and eager, the students proved an inspired and motivated group. Rendine Construction's first year as naming sponsors of the Geelong St Patricks Cup was a fantastic opportunity to bring together racing enthusiasts from across the region. Thousands flocked to the course to see Try Four take the honours in race six, the 1400m Rendine Constructions Geelong St Patrick's Cup. A great way to celebrate the popular St Pat's weekend. We will see you all at the races again next year. Rendine Constructions has grown dramatically throughout its 43 year history. So much so that we will soon move a larger office to accommodate our expanding staff numbers. We are staying in Moolap, moving just a short distance from our current headquarters to a location in Point Henry Rd. Works to refurbish our new office site will be completed later this year. Rendine has recently invested in cutting edge GPS survey equipment. We now have the in-house ability to conduct surveying and 3D modelling, allowing automated control of earthmoving equipment on site. Unnecessary string lines, pegs and labour are now a thing of the past, and earthmoving tasks are now able to be completed more productively and accurately than ever before, delivering ground breakingresults to our clients. You can count on Rendine to take the risk out of civil works for your next project. After undergoing an audit on our newly formed environmental management system in late 2014, Rendine is pleased to confirm we are now certified to ISO 14001:2004. This essentially means that our organisation commits itself to continually improve its environmental performance. Obtaining certification of our environmental system complements our pre-existing certifications to our quality and safety systems. Vitally, for Rendine's growth and versatility, this now allows us to prequalify for more Government tenders, broadening our avenues to win more projects and attract new clients. This is a great start to 2015! In its ninth season, the hugely popular series The Block saw Rendine Constructions build the winning apartment for contestants Simon and Shannon. The tattooed surfer brothers from Coffs Harbour proved early they were a force to be reckoned with taking out the first room win. The winning bedroom featured a raked ceiling, retro artwork and the use of natural materials, a theme they carried throughout the remainder of the build. A whopping $335,000 over reserve saw contestants Simon and Shannon crowned as series winners. Rendine Constructions are very pleased to announce that we have been appointed to build the new Community Centre in East Geelong for Karingal and a new Early Learning Centre at Our Lady Star of the Sea in Ocean Grove. The projects will be managed by Sarah Henderson and Tom McKay respectively. At the recent MBAV Awards Dinner, Rendine was awarded Best Commercial Building in the $3 to $6 million category for the Belmont Community Rehabilitation Centre. The project was built for Barwon Health, designed by Billard Leece and administered by Aurecon. The striking faceted timber clad faade contains a rehabilitation gymnasium, treatment rooms, utility rooms, staff offices and facilities. Opening off the gym, a mobility garden was built with changing levels, surfaces and finishes to aid patient recovery. Well done and thanks to the Rendine team and subcontractors involved with the project. Following on from previous projects, we have been appointed to complete two new buildings at Hendy St and Goldsworthy Ave for NBC. Work will be commencing shortly and they will be managed by Tom McKay. Congratulations to Brandon Thomas from the Rendine team! At the recent Group Training Awards, Brandon won the Safety First Award for leadership and initiative in OHS. He now is in the running for the best 4th year apprentice at the G Force Awards. We think that is fantastic that Brandon has been recognised for his leadership, positive attitude and willingness to take up a challenge while working at Rendine. Rendine Constructions recently handed over the new Joseph Innovation Trade Training Centre to St Joseph's College, Geelong. Lined with ply and ringed by high level windows, the new metal and woodworking workshops provide students with a beautiful environment to learn and develop new skills. On the first floor at the front of the building, a new allied health training room will be used to give students valuable skills and an introduction to the health professions. On the floor below, new classrooms and facilities complete the new building. Designed by local architecture firm McGlashan Everist, the building is a great addition to the schools building program. 2015 Master Builders of Victoria winner of Excellence in Construction of Commercial Buildings $1m-$3m. Rendine has been awarded the contract to construct a new Years 3+4 Learning Centre Extension at St Thomas Primary School, Drysdale. Work will start next week and is planned to complete in early March 2014. The project will be managed by Tom McKay. On the 3rd of August, Rendine celebrated its 40th successful year as one of the region's most successful commercial builders. Happy Birthday to us! In our fortieth year of operation, Rendine Constructions was presented with two awards; Best Sustainable Energy Project and Excellence in Commercial Construction Under $1m by the Master Builders Association of Victoria. Completed in 2012, the project included a self-shading facade, rammed earth walls, solar panels, use of recycled crushed rock and asphalt for car parks and hardstands and onsite treatment of sewerage and storm water. The works involved an extension of the office building, new equipment and storage sheds, and extra hardstands and parking for firefighting equipment. Built for the growing Geelong Lutheran College, the new Materials & Technology building will offer students the opportunity to learn skills in woodwork and metalwork. Rendine's construction experience delivered a building that passed the judges critical standards and sits with the awarded St Therese Church as examples of Rendine's commitment to quality construction. Thanks to all staff, clients, architects and subcontractors involved with these projects.